Some changeable weather the last 2 days. Yesterday I had wanted to visit Kata Temple in the afternoon, but the sun decided to take a holiday, and we had a thunderstorm. 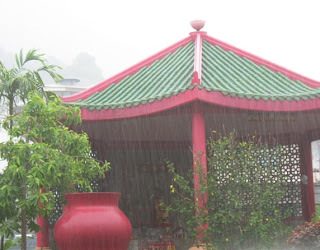 The rain was not only in Karon where I sat, but also in Kathu and Phuket Town. Thunderstorms tend to be isolated, but yesterday the heat broke with a bang all over Phuket! It's been quite windy the last 2 days too, though no big waves out at sea. The northeast winds can make things choppy, but not rough. Today was mostly a beautiful blue skied day, but again the afternoon looked to be heading towards a wet conclusion.. Would I be thwarted again in my efforts to blog Kata Temple? No! Around 4:30 the sun broke through again and I was able to head along the road to the temple. As I arrived, a foreign lady was also arriving on a bike and when she did, all the temple dogs came out to greet her. She was feeding them - a volunteer from PAWS (the Phuket Animal Welfare Society). 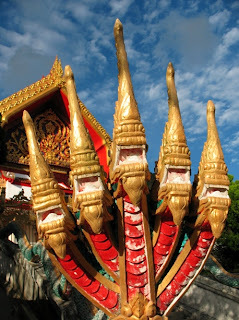 You can read more about Kata Temple on my Phuket Blog, and I'd like to write something about PAWS too. Looking forward to a sunny Saturday in Phuket... please.